One minute you are happily chugging along, making strip sets, chopping them up, marvelling at the new patterns they make when reassembled, next minute...I got my blocks out this morning, laid them out, as is my habit and suddenly thought, 'no, I'm over this now'. Short attention span, see? However, I have this group of bits, which still pleases me and I am thinking that one more row would get me within spitting distance of a reasonable size (floor tiles are 13" square, so I'm somewhere between 60" and 65" across at this point). So I will keep going, at least until I have made four more blocks. This isn't any sort of deliberate layout and I will sew them back into squares before I worry about that (just too much of a fiddle at the moment). I am torn between wanting to impose some sort of order and exactly the opposite. The compromise will be to have a think about the fabric combinations that go into the last four blocks. After that, I'm not sure. Maybe I will retrieve my enthusiasm and end up making another 18 blocks, but I wouldn't hold your breaths! Oh this is a winner!! I love the blocks just as they are, there is the secondary pattern where the blocks meet which creates another area for the eye to wander, I shall be interested to see the layout you decide to go with. I was wondering how far along you would get before you decided to switch things up. Sounds like you'll get a fair sized quilt regardless of what happens next!! I like what you have very much, but if you are bored your bored. I could see those triangles being used to make a zig zag quilt or in a goose tracks arrangement. There are lots of possibilities. With all we have to do it is funny that we could actually get bored, but I feel your pain! 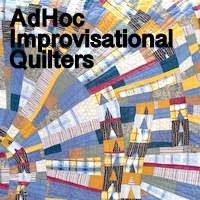 I have the attention span of an aphid except when it come to quilting! I did smile when I read this post, I'm sure we've all been there! You will find a solution, but I must say it's looking great so far! So many possibilities! Isn't it amazing how we change from day to day, an adventure for sure. I can understand that the surprise about the new patterns that came up now is not so surprising anymore. But I like what I see. It is in a way relaxing to look at. Looking forward what will come up in your mind. This is such a fun project. I hear you completely on being all gun-ho about something and then it suddenly spurts out on you. Isn't that how it goes so often? And hey, those shirts you found on the last post are fabulous. The strong value variations display the great colors so well. Making most of the strips in a block the same but then changing out with a similar or coordinating fabric creates another layer of interest. I like repeated block designs - at least for a while. You will create something wonderful to go with these. I am loving what you have done thus far. You will come up with something wonderful....you always do, you know.